muhammadu buhari and atiku abubakar. 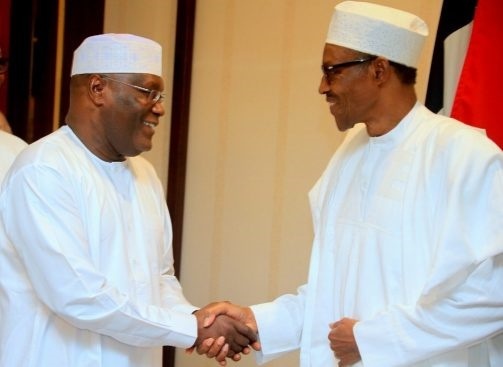 A former Vice President of Nigeria and the presidential candidate of the Peoples Democratic Party in the February 23 presidential election, Atiku Abubakar, has made a demand from Muhammadu Buhari's administration after an attack on Michika. Boko Haram and troops on Monday battled for Michika, a commercial community in Adamawa State, and there are claims that scores died while residents have fled the community. The battle for Michika, which started before 7:00 p.m. local time, lasted for hours before the troop successful chased insurgents out of the community. Michika is a community in the state of the presidential candidate of the Peoples Democratic Party (PDP) and a former Vice President, Atiku Abubakar. He is not happy about the attack and he has issued an advice to the administration of President Muhammadu Buhari on the matter. On his Twitter page Mr Abubakar expressed deep sadness over the attack. He wrote: "Deeply saddened by reported attacks in Michika Local Government Area, in Adamawa State. "I urge the FG to act swiftly by directing our security agencies to rein in and ensure peace is restored. Every Nigerian deserves a right to peaceful living". Troops in counter-terrorism operation in the northeast engaged the insurgents which attempted to infiltrate Michika through Kirchinga village in neighbouring Madagali local government, authorities in the state said. A resident of Bazza, a village near Michika, said most residents in the village had escaped to avoid the attackers.